It's nearly that time of year again. Our inaugural Oktoberfest was a blast last year, and we are looking to add one more event into the mix. This year we will have a Bags (Corn Hole) Tourney on Saturday afternoon. Sign up for the tournament will be at the brewery. Stay tuned for more info regarding the tourney. We will also have Masskrugstemmen (Stein Holding) both Friday and Saturday nights. Come show us your strength by seeing how long you can hold a liter stein filled with beer (approx 5.5 lbs). Winner's receive prizes and all participants will get to keep their SBC Logo 1 Liter Stein. There is an entry fee into the competition that is paid at the brewery the day of the competition. Disclaimer: This is not a nationally recognized Masskrugstemmen competition, but rather a fun local contest. We will have live Oompah music both nights again. Friday night will open with The Mayoral Prost at 7:30 by Mayor Don Keil and then music will kick off with last year's favorites, The Reed Meisters. Be sure to come early to claim your tables (seating begins at 5:00). The street will be closed and we will also have tables outside. 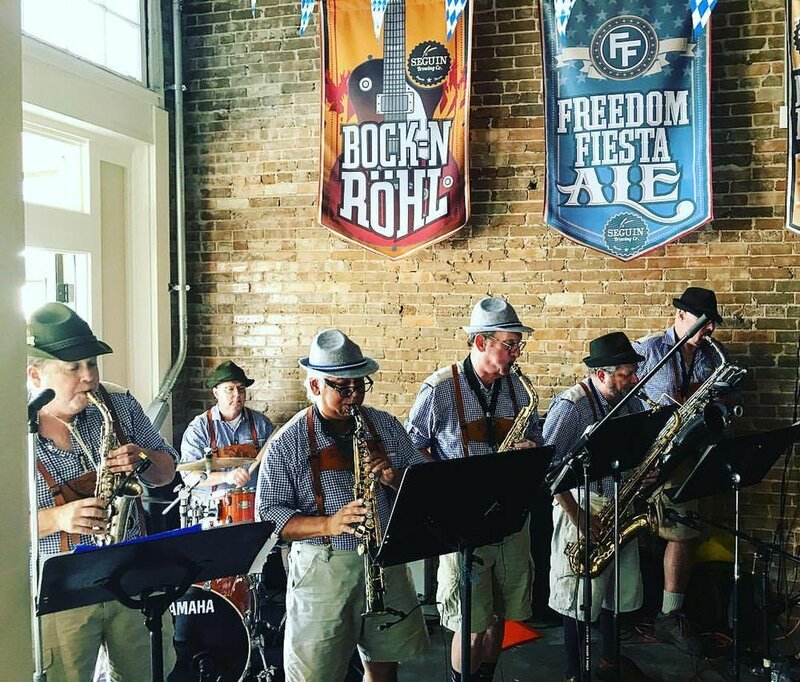 Saturday, new to our Oktoberfest, will be The Fritz Hodde Band. They will play two sets, one in the afternoon at 3:00 and one in the evening at 7:00. Check our events pages on www.seguinbrewing.com/events or www.facebook.com/seguinbrewingco for time updates. We will also have the Seguin Rotary Club back this year making brats that are cooked in our 9-Pin Kolsch. Last year's brats were a big hit. All bratwursts proceeds go towards the Rotarians fund raising efforts. We will also have Bavarian style soft pretzels available for purchase in the brewery. This year's event is sure to be bigger and better than last year and filled with great cheer. Come out and join us. Prost! Oktoberfest Beer is a style of beer just like a porter, stout or IPA. The style is determined by parameters that generally include certain malts, hops, and yeast in differing amounts. How each brewer alters those combinations makes each beer different. German Oktoberfest is golden in color with a light to medium body. American Oktoberfest tend to be orange in color with light to medium body. The alcohol percentages tend to be comparable, ranging from 5%-6.5%, roughly. German Oktoberfest are lager beers, generally made in March (Marzen style) and cellared until they're tapped by the mayor of Munich signaling the start of the festival. American Oktoberfest tend to be ales made one to two months before they're released (this is definitely not always true and depends on the brewery). American Oktoberfest tend to be slightly to much sweeter depending on the brewery. In Germany, it is rude to chug an Oktoberfest bier. Augustiner, the brewery that made the beer I am drinking in the picture has been brewing since 1328 and is still family owned (according to a Munich local, I didn't actually fact check that). Seguin Brewing Company has been brewing beer since November of 2014 and we are still friend and family owned (according to me and I did fact check that). Some of the tents require reservations to enter and sit at a table. Make friends with the locals and you'll have a great time. If you can't get into a tent, there are plenty of biergartens outside of the tents to get some beer. Here I am enjoying an Augustiner Oktoberfest at one of their biergartens. This is just one of the Augustiner tents. Each tent holds thousands of people and some require a reservation to get in. Oktoberfest is an absolute blast, and I learned that Wurstfest, in New Braunfels, while being much smaller in size, feels much like the real thing. Oktoberfest beer has always been one of my favorite styles of beer. Get out there and enjoy a Texas take on the old world style Oktoberfest by grabbing a Seguin Brewing Co Oktoberfest. Prost! Zum Wohl! Over the course of starting this business I have had many people ask me, "Why Seguin for a brewery?" My response was usually candid in explaining this is my home; this is where I grew up; I have friends and family here; this is what I know, and I enjoy living in my hometown. As I continued to hear people ask this question with genuine interest, I began answering the question, "Why not Seguin?" Generally I received a slew of answers ranging from demographics, socioeconomic, to there is nothing to do in Seguin, and many other responses that have a negative connotation about this community. These reasons cause some to believe Seguin seems like an odd choice. But generally those exact reasons are indeed why Seguin is the perfect place for a brewery and other new small business ventures because there is opportunity and change and growth happening here. It is a fun time for our historic town, and these are some of the answers to the question, "Why Seguin?" 1. Progress. Seguin is a great town in which to live. We have agriculture, parks, lakes, small shops, local restaurants, an amusement park, a nationally recognized university, a regional hospital, manufacturing, diversity and a wonderful family oriented community. As a city, we have so much great growth occurring in both small and larger businesses coming into town and creating jobs and stimulating the local economy. We have this amazing effort taking place to revitalize our historic downtown and return it to a place that is vibrant with shops, retail, and living. This has come from the efforts of many men and women who call Seguin home, and it is these people who have been the catalysts for growth and progress. 2. Opportunity. One of the greatest accomplishments a person can make in their lifetime is to make a positive difference. The difference doesn't have to be monumental to the world to be impactful. The difference can be small and monumental to a few, but it is still making a difference. We feel like we have an opportunity to make a difference in Seguin. We have an opportunity to create a product for this community to be proud of and call its own. We get to be apart of the ground level of the city's new growth. We have an opportunity to work with other small local businesses to help them reach new customers and generate new business. We can stimulate economic growth here in our community and even though it may be in a small way we are nonetheless excited for this opportunity. 3. Pride. The greater part of this community cares about and has pride for Seguin. These people are just as excited to see the new growth and support the local businesses within our community. It is these people that help us prove "why Seguin" everyday as nearly 50% of our beer sales come from right here in this community. Our citizens have proven that there is a market for craft beer in this town, but more importantly it is local products that they care about because those products came from this community - a community in which they have great pride. 4. Small town, big nuts. People enjoy our tagline and we are happy it provides them with a chuckle. We hope it creates a way for consumers to remember us and our products. But the tagline is more than just a celebration of the World's Largest Pecans. In fact, the tagline is deeper than that because it also represents the people who are nuts about this town. These people are everywhere in Seguin and their passion for our community is impossible for them to hide. It is with great pleasure that I get to watch eyes light up when people share our town's interesting history, or share the successes of our local youth sports, or discuss the renovations in the downtown. So yes, the tagline is about the pecans, but it is also about the big nuts that live in this small town and work to see it prosper. Good things are happening here, and we are happy to be a small part of it. Cheers from Seguin Brewing Company. May is a month full of events for your local beer makers. We began the month with a bang by opening our doors for our first tours ever. The day was enjoyable and the weather couldn't have been better. Stay tuned for another tour day in June. Still to come in May we have events scattered throughout the rest of the month. Next week on Wednesday, May 13th join us at Patek's Craft Beer Bar in New Braunfels located at 494 N Union Ave. We will be tasting Honey Pecan #5, Black Rye Reserve, and 9-Pin Kolsch. In addition to meeting the brewers you can get a free glass with the purchase of a SBC beer. May 21st we will be co-hosting a Seguin Chamber of Commerce Mixer with the Power Plant in Seguin. This event will be for chamber members only. May 22nd we will be in Kyle at the Twin Liquors sharing samples of Honey Pecan #5, Black Rye Reserve, and 9-Pin Kolsch. All styles will be available for purchase. This month is going to fly by. Don't miss an opportunity to meet the owners and operators of Seguin Brewing Company. We always look forward to meeting new people and sharing our love of beer. Cheers.